Ethan Allen Institute Sponsors Common Sense Radio with Bill Sayre, broadcasting from from Station WDEV on both the Airwaves and the Internet. Weekdays: 11 o’clock till noon. On the airwaves at: 96. 1 FM, 550 AM, 96.5 FM, and 101.9 FM. Call numbers for the show are 802-244-1777 or 877-291-8255. The Schedule of Upcoming Shows of Common Sense Radio can be found on the Ethan Allen Institute Facebook Page. Below are Links to Recordings of Past Episodes of the Show, where the date highlighted in bold. Monday, April 8th, 2019. What will be the consequences for Vermont job seekers, job creators, and job holders from the new taxes and regulations being created by our Legislature? Matthew Strong joins Rob Roper to review. Tuesday, April 9th, 2019. What is ranked choice voting, and how might it affect the future of Vermont elections? Guy Page and Bill examine. Wednesday, April 10th, 2019. What is the idea of a nudge, and how can it help encourage people to make better financial choices, but still leave the final decision in their hands? One Day in July’s Dan Cunningham and Bill explore. Thursday, April 11th, 2019. What is the hidden face of homelessness in Vermont? The Committee on Temporary Shelter’s Becky Holt joins the Lake Champlain Chamber’s Tom Torti and Bill to take a closer look. Friday, April 12th, 2019. How did our founders discover that government inevitably will strive to restrict ever further the freedom of individuals, unless individuals strive to limit the power of government? John McClaughry and Bill explain. Later, David Flemming joins Bill to discuss a proposals to impose further regulatory burdens on purchasers of health insurance. Monday, April 1st, 2019. Should you be free to use plastic bags, instead of paper or cloth, if you so desire? Or should the government decide for you? Rob Roper joins Bill to explore. Tuesday, April 2nd, 2019. If our Legislators prohibit association health insurance plans, are they putting small businesses at a competitive disadvantage to large businesses? The Vermont Chamber’s Betsy Bishop and Bill examine. Wednesday, April 3rd, 2019. Broadcasting live from the Central Vermont job fair, Bill is joined by Doug Gahn, Jim Cressey, and Jamie Stewart to review the challenges and opportunities for Vermont job creators as they aim to find new employees, and Vermont job seekers as they aim to find new employment. Friday, April 5th, 2019. What should we know about the newly launched Long Falls Paperboard Company, and how it will contribute to opportunity and prosperity for the people of Vermont. Long Falls Paperboard’s Ben Rankin joins Bill to explain. Monday, March 25th, 2019. What does it appear that the long awaited Mueller Report will say about collusion between Russia and the Trump Campaign for President? Rob Roper and Bill consider. Tuesday, March 26th, 2019. Why is it important to look beyond good intentions when testing for good policy? Matthew Strong and Bill explain. Wednesday, March 27th, 2019. What should we know about the Farm Service Administration, and its work to help Vermont farmers succeed? FSA Administrator Wendy Wilton joins Bill to take a closer look. Thursday, March 28th, 2019. What is the under-appreciated role of high tech industry in the Vermont economy, and how can it help arrest and reverse Vermont’s decline in the number of young individuals and the families they might otherwise start? Brandthropoly’s Matt Dodds and Bill explore. Friday, March 29th, 2019. What should we know about new technologies in energy storage and carbon capture, Jason Gibbs, the Governor’s representative to the Global Energy Summit, joins Bill by phone from the Conference to review. Later Meg Hansen and Bill examine little understood, but quite important, health care reforms underway in Montpelier. Monday, March 18th, 2019. Are carbon taxes resting in peace, or lying in wait? John McClaughry joins Bill to explore. Later, Meg Hansen and Bill consider little understood health care reforms under deliberation in the Legislature. Tuesday, March 19th, 2019. What about Vermont demographics should we understand if we want our economy to grow, and our people to afford the cost of living here. Art Woolf and Bill explain. Wednesday, March 20th, 2019. What proposed changes in state law and regulation will affect the cost of living for our people and the cost of doing business for our job creating enterprises. Ed Larson and Bill Moore examine. Thursday, March 21st, 2019. What key issues before the Vermont Legislature will affect you at home and at work? Guy Page and Matthew Strong review. Friday, March 22nd, 2019. What should we know about the rapid advance in energy storage technology and the role of a Vermont company in propelling that advance. Dynapower’s Adam Knudsen joins Bill to take a closer look. Monday, March 11th, 2019. Should the 2nd freedom guaranteed in the Bill of Rights be further restricted in Vermont? Rob Roper and Bill Moore join Bill to consider. Tuesday, March 12th, 2019. What should we know about the Vermont State Budget, and can we say that our State Government is living within its means? Vermont Finance Commissioner Adam Greshin and Bill take a closer look. Wednesday, March 13th, 2019. How do companies best distribute value to their shareholders — dividends or stock buybacks? One Day in July’s Dan Cunningham and Bill evaluate. Thursday, March 14th, 2019. Are there ways to save energy while reducing the cost of living for our people and the cost of doing business for our job creators? Rebecca Foster, of Vermont Energy Investment Corp., joins the Lake Champlain Chamber’s Tom Torti and Bill to explore. Friday, March 15th, 2019. What is the Vermont Council on Rural Development, and how do they help improve the lives of our people, and the communities in which they live and work. Council Director Paul Costello and Bill examine. Monday, March 4th, 2019. What questions are important to ask of your legislators at Town Meeting? Rob Roper joins Bill to consider. Tuesday, March 5th, 2019. Can we improve the affordability of housing in Vermont by reducing regulatory burdens? Ali and Nick Zaiac join Bill to examine. Wednesday, March 6th, 2019. What Legislation under consideration in Montpelier will affect our working farms and forests, and the people who earn their living from them? Ed Larson and Bill take a closer look. Thursday, March 7th, 2019. Why is it that socialist proposals, at least on the surface, seem so helpful to people, and free market proposals seems so harsh, while in reality, just the opposite is often the case? Matthew Strong and Bill explore. Friday, March 8th, 2019. Is there a relationship between how free a society is, and how prosperous it is? Bruce Shields and Guy Page explain. Monday, February 25th, 2019. Will the Legislature’s proposed changes to Act 250 impede our goals to grow population, jobs, and the economy? Rob Roper joins Bill to review. Tuesday, February 26th, 2019. Is income inequality increasing, or does it all depend on how we measure it? Art Woolf and Bill explain. Thursday, February 28th , 2019. Why is it important for Vermont business leaders to learn from leaders in other parts of the world about other cultures, and opportunities to better understand one another, to cooperate, and to improve the lives of all. Vermont Council on World Affairs Executive Director Patricia Preston joins Lake Champlain Chamber’s Tom Torti and Bill to explore. Friday, March 1st, 2019. What are the environmental priorities for Vermont, and how do we best address them? Natural Resources Secretary Julie Moore joins Bruce Lisman and Bill to consider. Monday, February 18th, 2019. Were you aware that our Legislature is proposing a new payroll tax of more than $100 million, when Vermont already has one of the highest tax burdens of any state in the nation? Rob Roper joins Bill to review. Tuesday, February 19th, 2019. What can we learn about Vermont’s role in the Civil War from the experiences of a 14 year old volunteer from Grafton? Author Tom Fontaine, who also teaches at Kurn Hattin School, joins Terry Gulick and Bill to consider. Wednesday, February 20th, 2019. What are the priorities for the Legislature, and how will they affect us at home and at work? Guy Page and Bill examine. Thursday, February 21st, 2019. How can two people from opposite ends of the political spectrum find common ground, and when they cannot, strive to understand one another, the the assumptions we make, and how and why we reach different conclusions. Bill Schubart and Bill explore. Friday, February 22nd, 2019.What is the best way to ensure that our teachers and State employees have adequate retirement funds? And how much tax revenue are we losing from as Vermonters move to other states? David Coates and Bill explain. Monday, February 11th, 2019. What is the New Green Deal, and how will it affect our cost of living and cost of doing buiness? Rob Roper joins Bill to consider. Tuesday, February 12th, 2019. What is a new, non-traditional approach to helping people pay for health care, which holds the potential of substantially lower costs and equal quality for many families and individuals? Dan Treat explains, with Bill. Wednesday, February 13th, 2019. Honoring the life and legacy of Jack Bogle, Dan Cunningham and Bill explain how his idea of index funds has revolutionized the financial services industry? Thursday, February 14th, 2019. What are the most important issues facing the Vermont Legislature this year, and how do they affect Vermont job creators? Lake Champlain Chamber’s Austin Davis and Tom Torti join Bill to review. Friday, February 15th, 2019. What is a Certificate of Need, and how does it affect health care access, cost, and quality? Mercatus Center’s Matt Mitchell joins Bill to explore. Monday, February 4th, 2019. Has Act 46 succeed in restraining the cost of education, while preserving opportunities for school choice? Rob Roper joins Bill to evaluate. Tuesday, February 5th, 2019. What should we know about middle class income in Vermont? Art Woolf and Bill review. Later, John McClaughry joins Bill to examine the legislative report on reducing Vermont’s carbon footprint. Wednesday, February 6th, 2019. Why are economic, political, and religious freedoms so closely connected, today and throughout history? Bruce Shields joins Bill to explore. Thursday, February 7th, 2019. What is one of most important factors, often under recognized, in sustaining our working forest economy, and the many environmental benefits that rest upon it? Sam Lincoln and Bill take a explain. Friday, February 8th, 2019. What are the most important public policy challenges facing our nation and our state, and what is the key to addressing them successfully? Former Governor Jim Douglas and Bill take a closer look. Monday, January 28th, 2019. How do the people who earn their living from our working forests, benefit the Vermont economy, environment, and community. The Sustainable Forestry Initiative’s Ed Larson joins Bill to explore. Tuesday, January 29th, 2019. Live from the Vermont Farm Show, with the help of Laurence C. Jost, aka LCJ, Ron Paquette and Terry Gulick join Bill to describe the role of Alpha Gamma Rho Fraternity in producing Agricultural Leaders in Vermont and America. Later they are joined by Vermont Woodlands Association’s Kathleen Wanner to learn about the work and the people of her organization. Wednesday, January 30th, 2019. Live from the Vermont Farm Show, Vermont Secretary of Agriculture Anson Tebbetts joins Bill to examine the challenges and opportunities before Vermont farmers, their land, and their communities. They are joined by Chris Hill of Lely Robotic Milking Systems, and Amanda Voyer of the Vermont Sugar Makers’ Association. Thursday, January 31st, 2019. Live from the Vermont Farm Show, the Lake Champlain Chamber’s Tom Torti and Bill interview Harold Howrigan and Kiersten Bourgeois of St. Albans Creamery, and Chris Bessette of the Yankee Farm Credit for a closer look at those businesses who provide markets for farm products, or who provide services to farm producers. Friday, February 1st, 2019. What Legislative Issues create the greatest concern for Vermont businesses who want to grow the economy, create jobs, and invest in new technologies and equipment. The Central Vermont Chamber’s Bill Moore and Bill review, focusing on proposals for government mandated wages and benefits. Monday, January 21st, 2019. Are there ways to accomplish social goals, improving the lives of our people, without raising taxes or fees? Rob Roper joins Bill to review. Tuesday, January 22nd, 2019. What are the barriers to economic growth, job growth, and affordable living costs in Vermont. Critical Process Systems’ CEO Paul Frascoia and Bill evaluate. Wednesday, January 23rd, 2019. What can we learn from the work of Hubbard Brook Research Center that will help us understand and improve water quality in Lake Champlain? Bruce Shields and Guy Page examine. Later, Bruce and Guy review legislative proposals to increase the cost of living for those who make their home in rural areas of Vermont. Thursday, January 24th, 2019. What should we know about the economy, culture, and government of Cuba, especially about how the people there benefit as markets and capitalism emerge from a socialist economy. Art Woolf, who has returned from a recent visit to Cuba, joins Bill to explore. Friday, January 25th, 2019. What does the United Van Lines analysis of their customer moving patterns tell us about migration patterns in Vermont? UCLA’s Michael Stoll joins Bill to explain. Later, Susanne Young joins Bill to take a closer look at the Governor’s Budget, which he unveiled the previous day. Monday, January 14th, 2019. What will be the Legislative priorities this coming Session, and what are the unintended consequences? Rob Roper joins Bill to consider..
Tuesday, January 15th, 2019. How do we best prepare our young people for the opportunities of the future, while at the same time, helping our entrepreneurs and other businesses find the skills and talents they require to grow and prosper? Professor Jim Black and Bill take a closer look. Wednesday, January 16th, 2019. How will All-Payer Health Care affect wait times for Vermont health care patients, particularly Medicare patients? Louis Meyers joins Bill to examine. Thursday, January 17th, 2019. What should we know about the commercial real estate market, and what it tells us about the health of the Vermont economy? Brad Worthen joins Tom Torti and Bill to explore. Friday, January 18th, 2019. How will proposed Act 250 reforms affect the divide between urban and rural cultures in Vermont? John McClaughry and Bill explain. Later Meg Hansen joins Bill to test the evidence as to whether we have entered a modern feudal age. Monday, January 7th, 2019. Why will those protesting the Carbon Tax this week in Montpelier, be wearing yellow jackets? Rob Roper joins Bill to consider the reasons. Tuesday, January 8th, 2019. What should we know about Vermont health insurance and other employee benefits, and their effect on our job seekers, job holders, and job creators? Hickok and Boardman’s Michael Kilfoyle and Bill explore. Wednesday, January 9th, 2019. How do we best understand stock market performance in 2018? Dan Cunningham and Bill take a closer look. Thursday, January 10th, 2019. How have new technologies and changing markets affected paper making in the Northeast, and in turn affected forestland ownership patterns, and the forest products industry? Bruce Shields and Mathew Strong examine. Friday, January 11th, 2019. Are most Vermont schools trapped in the technologies and methods of the past? Why is school choice a way to break through the barriers to improvement, and create the best opportunities for our children to prepare for a rapidly changing future? Brad Ferland and Asher Crispe join Bill to explain. Monday, December 31st, 2018. Should we impose a carbon tax on families and individuals as they drive to work or to get groceries, or take their children to school. And a carbon tax on farmers, loggers, and on those who deliver steel, electronic equipment, wholesale food, and Amazon boxes? John McClaughry and Bill examine. Later Meg Hansen joins Bill to consider the consequences for Vermont and other States of a Federal Court ruling that declares the Affordable Care Act unconstitutional. Tuesday, January 1st, 2019. No show on New Year’s Day. A day to reflect on what we have learned from the year just passed, and what we will learn in the year ahead. Oh yes, and perhaps also to watch some good football games with family and friends. Wednesday, January 2nd, 2019. What should we know about Vermont labor markets – what’s the good news, the not so good news, and what can we do to help? Labor Commissioner Lindsay Kurrle and Labor Department Economist Mathew Barewicz join Bill to take a closer look. Thursday, January 3rd, 2019. What can we learn from our young professionals about how the Vermont brand must continue to evolve, to keep the Vermont economy competitive, attractive, and growing? The Lake Champlain Chamber’s Erin Bombard, Victoria Colarusso, and Tom Torti join Bill to explore. Monday, December 24th, 2018. Have politically correct criticisms of Christmas traditions gone too far? Rob Roper joins Bill to examine. Later, Bill reviews how the economy affects the stock market, and how the stock market affects the economy. Tuesday, December 25th, 2018. No show on Christmas Day. A day to honor and celebrate the traditions of Christmas, with hope, love, joy, and peace. And to remember the reason for the season. Wednesday, December 26th, 2018. Why was religious freedom important to our nation’s founders, and why is it important to us today? Bruce Shields and Bill explore. Thursday, December 27th, 2018. What should we know about Wildlife Management in Vermont? Commissioner Louis Porter and Wildlife Director Mark Scott join Bill to explain. Friday, December 28th, 2018. How will reforms of Act 250, proposed by a Legislative Summer Committee, affect those who work or live in rural areas? Guy Page and Bill take a closer look. Monday, December 17th, 2018. Is there evidence that the political tide is turning in favor of school choice for families and their children? Rob Roper and Bill review. Tuesday, December 18th, 2018. What are some of the key factors that determine the success of a working farm and the farmer who works it? UVM Extension Service’s Jenn Colby and Bill take a closer look. Wednesday, December 19th, 2018. What is Smart Growth, and do Smart Growth regulations unduly restrict landowner property rights? Curtis Carpenter and Bill explore. Thursday, December 20th, 2018. How does the Vermont Manufacturing Extension Center help improve the efficiency and competitiveness of our Vermont job creators? Karl Swanke joins Lake Champlain Chamber’s Cathy Davis and Bill to explain. Friday, December 21st, 2018. How will government mandated minimum wages affect our small businesses, the jobs they create, and the people who seeking to hold those jobs? St. Michaels Professor Robert Letovsky and Bill examine. Monday, December 10th, 2018. What can we learn about subsidizing commuter rail in Vermont, from similar proposals, funded by taxes on fossil fuels, in France? Rob Roper and Bill explain. Tuesday, December 11th, 2018. What are the major public policy issues facing Vermont farmers, and therefore affecting all of us who benefit from the rural economy, environment, and culture. Vermont Secretary of Agriculture Anson Tebbitts and Bill examine. Later Cary Giguere and Stephanie Smith join Bill to discuss Vermont’s emerging hemp industry. Wednesday, December 12th, 2018. What factors cause volatility in the stock market, and are their effects predictable, or only visible after the fact? One Day in July’s Dan Cunningham and Bill explore. Thursday, December 13th, 2018. Joel Najman joins Chris Barbieri to remember the history of Rock n’ Roll, and the profound effect it has had on American culture. Friday, December 14th, 2018. What is the outlook for the Ski Season, and it’s important contribution to Vermont economy? Sugarbush Resort’s Win Smith joins Bill to take a closer look. Later, Jason Gibbs joins Bill to discuss the Administration’s priorities in the upcoming Legislation Session and what it will take to accomplish them. Monday, December 3rd, 2018. Remembering George H.W. Bush. Also what can we learn from carbon taxes in France and tariffs in China, that will affect families and businesses in Vermont. Rob Roper and Bill explain. Tuesday, December 4th, 2018. What are the important challenges facing our Vermont farmers, and therefore affecting all of us who benefit from the rural economy, environment, and culture. Farm Bureau President Joe Tisbert and Bill examine. Wednesday, December 5th, 2018. How do we best sustain Vermont’s working forests, and the people who work them? Ed Larson, Bruce Shields, and Bill take a closer look. Thursday, December 6th, 2018. How do we improve Vermont water quality, at a price affordable for our people and our businesses? Ernie Pomerleau and Warren Coleman join Lake Champlain Chamber’s Tom Torti, and Bill to explore. Friday, December 7th, 2018. What the chief factors affecting health care cost, availability, and quality, and what should we be doing to turn those factors for the better? Meg Hansen and Bill review. Monday, November 26th, 2018. What can we learn from the forest fires in California about why property taxes are so high in Vermont? Rob Roper joins Bill to explain. Tuesday, November 27th, 2018. What was the ethics scandal that challenged the integrity of the Vermont judiciary in the late 1980s? Bill interviews Jim Dunn, author of Breach of Trust, for the answer. Wednesday, November 28th, 2018. What are the likely priorities for the new Legislature? John McClaughry and Bill examine. Later, Art Woolf and Bill consider whether recent statistics on Vermont employment give us a window into Vermont’s future. Thursday, November 29th, 2018. How can we remove phosphorus from Lake Champlain in a way that is both effective and affordable. Warren Coleman joins Lake Champlain Chamber’s Tom Torti and Bill to explore. Friday, November 30th, 2018. How will a Carbon Tax affect Vermont families and businesses. Vermont Fuel Dealers Association’s Matt Cota and Chris Barbieri review. Monday, November 19th, 2018. What are the pros and cons of giving substantial government subsidies to Amazon for locating their new headquarters in New York and Virginia? Rob Roper joins Bill to consider. Tuesday, November 20th, 2018. What do the elections mean for energy policy in Vermont and America? Guy Page and Bill examine. Wednesday, November 21st, 2018. Why is Thanksgiving important to our history, our culture, and to perpetuating the ideals of a free society? Also, what is the little known but true story of the First Thanksgiving for the Pilgrims at Plymouth Rock? Robert Maynard and Bill explain. Thursday, November 22nd, 2018. No show today. Take time to give thanks for the many blessings our creator has bestowed upon us, Including the blessings of liberty, who our founders believed a Constitutional Republic could secure. Friday, November 23rd, 2018. Why should we be grateful at Thanksgiving and always? Matthew Strong and Bill explore. Monday, November 12th, 2018. How can we use free market principles to understand and solve public policy problems? Rob Roper demonstrates. Tuesday, November 13th, 2018. What should we know about the work of the Calvin Coolidge Presidential Foundation? Former Governor Jim Douglas interviews Foundation leaders Amity Shlaes and Matt Denhart for an update. Later, Governor Douglas is joined by Steve Perkins of the Vermont Historical Society, to discuss the mission of the Society, and how they accomplish it. Wednesday, November 14th, 2018. Has the stock market been volatile this year, by historical standards, and if so, what does it mean for sound investment strategy? One Day in July’s Dan Cunningham joins Bill to explain. Thursday, November 15th, 2018. What are the most important agricultural issues facing the legislature this coming Session? Harvey Smith joins Bill to explain. Friday, November 16th, 2018. How do the Vermont Scouts help prepare our young people become the future leaders of Vermont? Scout Executive Ed McCollin and Bill describe. Monday, November 5th, 2018. What are the issues that are most important to you in deciding how to vote in the elections on Tuesday? Rob Roper joins Bill to explore. Tuesday, November 6th, 2018. As Vermont’s election cycle comes to a close, what should we know about the rules and regulations governing contributions to political campaigns? Informed Vermonter author Malcolm Steward and Bill examine. Wednesday, November 7th, 2018. Who are the Rising Stars in Vermont business, and how are they making Vermont a better place to live and work? Vermont Business Magazine’s John Boutin, and Bill take a closer look. Thursday, November 8th, 2018. What should we know about the best ways to weatherize our homes, to keep warm and save energy this winter? Representatives of Efficiency Vermont and Waterbury’s Energy Committee join Lake Champlain Chamber’s Tom Torti and Bill to explain. Friday, November 9th, 2018. What do the election results tell us about the cultural divide between urban and rural America. Bruce Shields and Bill consider. Monday, October 29th, 2018. Can government social support programs help the vulnerable and those in need, without creating a dependency that stifles individual initiative, self-reliance, and personal responsibility. Rob Roper joins Bill to explore. Tuesday, October 30th, 2018. Why was the State of Vermont’s credit rating get lowered, what does it mean for us, and what must we do to restore It? David Coates and Bill review. Wednesday, October 31st, 2018. How do we make the cost of living more affordable for our people, the cost doing business more affordable for our job creators, and thereby, grow household income at a faster pace? Central Vermont Chamber’s Bill Moore and Bill explain. Thursday, November 1st, 2018. What is the mission of the Energy Action Network, and how do they aim to accomplish it? EAN’s Jared Duval joins Lake Champlain Chamber’s Tom Torti and Bill to take a closer look. Monday, October 22nd, 2018. Can government social support programs be designed to help the vulnerable and those in need, without creating dependency, that stifles individual initiative and responsibility. Rob Roper explores. Tuesday, October 23rd, 2018. What can we learn from a leading Vermont business about what it takes to compete successfully in national and global markets? Revision Military’s Greg Maquire and Bill take a closer look. Wednesday, October 24th, 2018. How do we measure the poverty level in Vermont, and are we making progress in reducing poverty among our people? UVM Economist Art Woolf and Bill examine. Thursday, October 25th, 2018. What is Financial Wellness and why is it important to Vermonters? Key Bank’s Joe McGowan and Joe Luciano join Lake Champlain Chamber’s Catherine Davis and Bill to explain. Friday, October 26th, 2018. Can a government mandate that every household must buy health insurance, cause an income transfer from people with modest incomes to people with high incomes? John McClaughry and Bill take a closer look. Monday, October 15th, 2018. How are our opinions about history, current events, and political activism affected by what we see and hear from the media. Rob Roper and Bill explore. Tuesday, October 16th, 2018. Are there new energy systems that both have fewer emissions and are less costly to operate? Is it important to allow people to make their own choices as to the type of energy they use, or should the government decide for them? Matthew Strong and Guy Page take a closer look. Wednesday, October 17th, 2018. What is forest fragmentation, what are the reasons for it, and what are the best ways to discourage it? Vermont Natural Resources Council’s Jamey Fidel joins Bill to explore. Thursday, October 18th, 2018. What is the Vermont Tech Jam and why is it important to all those in Vermont who care about innovation, new technology, and career growth? Seven Days’ Cathy Resmer and Bill review. Friday, October 19th, 2018. What is the difference between a Democracy and a Constitutional Republic? Why is it important to understand how the Constitution protects individual liberty by separating and limiting the power of government? The Vermont Traditions Coalition Bill Moore and Bill explain. Monday, October 8th, 2018. What can we learn from our recent experience with the Kavanaugh nomination to the Supreme Court about the Constitution, political decision making, and tribal divisions. Rob Roper and Bill explore. Tuesday, October 9th, 2018. What are the key ingredients to building a successful business in Vermont? Twincraft Skincare CEO Peter Asch joins Bill to take a closer look..
Wednesday, October 10th, 2018. What factors affect the stock market, the bond market, and the economy? One Day in July’s Dan Cunningham and Bill review. Thursday, October 11th, 2018. Does a government mandate requiring individuals to buy health insurance have the unintended consequence of reducing access to health care, and increasing the cost of insurance. Meg Hansen and Bill explain. Friday, October 12th, 2018. What is the Vermont Talent Pipeline, and how does it improve opportunity career opportunities for our young people, and the skills that our businesses require? Vermont Business Roundtable’s Mary Anne Sheahan and Bill examine. Monday, October 1st, 2018. What does the future hold for Vermont’s communities? Broadcasting live from the Council on Rural Development’s Community Leadership Summit, at Castleton University, Bill interviews past, present, and future Vermont community leaders. Molly and Hank Lambert, and Tim Smith. Tuesday, October 2nd, 2018. What are the priority issues that our next Legislature and Governor must address? And, media bias: does it exist, and if so, how do we measure it? Rob Roper and Bill explore. Wednesday, October 3rd, 2018. What can we learn from one of Vermont’s most successful businesses about the best way to create opportunity and prosperity for the Vermont people? Chroma Technology’s Paul Millman joins Bruce Lisman and Bill to explain. Thursday, October 4th, 2018. What role does forestry certification, such as the Sustainable Forestry Initiative, play in keeping Vermont woodlands both productive and healthy. Ed Larson, Bruce Shields, and Bill take a closer look. Friday, October 5th, 2018. Why is manufacturing important to the Vermont economy, and to the well being of all Vermonters? On National Manufacturing Day, Bob Zider and Patricia Giavara join Bill examine. Monday, September 24th, 2018. Is local control of education a politically popular illusion? Rob Roper and Bill explore. Tuesday, September 25th, 2018. What is the effect on small communities of forced consolidation of Vermont schools. John McClaughry and Bill review. Later, Tom Schatz, of Citizens Against Government Waste, joins Bill to consider whether earmarks should be restored in the federal budget? Wednesday, September 26th, 2018. What is democratic socialism, and what does it mean for the people who live and work under it? Art Woolf and Bill take a closer look. Later, Bill is joined by Ralph Peterson who shares lessons from his new book, and his life’s story, to show us how hope, determination, and resolve we can help us overcome obstacles to achieving our goals in life..
Thursday, September 27th, 2018. What is a co-living accelerator environment, and how can it help make Vermont a preferred destination for start-up entrepreneurs who can grow rapidly. Frank Koster, of Vermont Works, joins Tom Torti and Bill to explain. Friday, September 28th, 2018. What are the latest developments in energy news, and in how we in Vermont can achieve energy that is affordable, reliable, and increasingly, renewable and low in carbon. Guy Page and Bill examine. Monday, September 17th, 2018. Less restrictive rules on early voting, and absentee voting, make it more likely that potential voters will actually vote, but also perhaps, increase the risk of voter fraud? Rob Roper and Bill explore. Tuesday, September 18th, 2018. What should we understand about the challenges facing Vermont dairy farmers, and how has one farm overcome those challenges. Jasper Hill Farm’s Mateo Kehler and Yankee Farm Credit’s Brenda Frank join Bill to explain. Wednesday, September 19th, 2018. How do we measure the performance of the Vermont economy, in producing opportunity and prosperity for our people, and what can we do to improve our performance? Vermont Teddy Bear’s Bill Shouldice and Bill review the work of the Vermont Futures Project. Friday, September 21st, 2018. What role do our State Colleges play in improving the opportunity for our people to learn, and for our businesses to find the skills they require to expand and grow in Vermont. State College Chancellor Jeb Spaulding and Bill examine. Monday, September 10th, 2018. As trade tensions escalate, including proposed new tariffs on American farm products, what can be done to help our American farmers? Vermont USDA Farm Service Director, Wendy Wilton, and Bill take a closer look. Tuesday, September 11th, 2018. Who are the fastest growing businesses in Vermont, and what makes them grow so fast? Vermont Business Magazine’s John Boutin and Bill review. Wednesday, September 12th 2018. What is the philosophy of regulatory humility, and how can we see it at work as internet freedom is restored? Federal Communications Commission Chairman, Ajat Pai, joins Bill to explain. Later, Dan Cunningham and Bill continue their discussion of how the choices we make affect our income in retirement. Thursday, September 13th, 2018. Why is free trade so important to the North American Economy? Greg Durocher, President of the Cambridge Ontario Chamber of Commerce, joins Tom Torti and Bill to explore. Friday, September 14th, 2018. Broadcasting live from the Tunbridge World’s Fair, Peter Langrock joins Bill to reflect upon his decades of experiences in harness racing, applying the law, and defending individual liberty. Later, Champlain Valley Equipment’s Alonzo Blackmore and Bill discuss the importance of rural people, and the farmland and forestland from which they earn their living, to Vermont’s rural economy, environment, and community. Monday, September 3rd, 2018. Labor Day. No show today. A day to honor and remember all those who have labored to build better lives for their families, and better communities for us all. Tuesday, September 4th, 2018. What threatens the core wellness of our first responders, and what can we do to help them? Pastor Bill Elwell and Clinician Lori Gurney join Bill to explain. Wednesday, September 5th 2018. As trade tensions rise between Canada and the United States, how do we sustain our belief in free trade. St Michaels Professor Robert Letovsky and Bill review. Then at 11:25 AM, Red Sox Baseball from WDEV Radio Vermont. Thursday, September 6th, 2018. What is the Manufacturer’s Expo, and what does it tell us about the importance of industry to Vermont’s growth in income, employment, and productivity. The Vermont Chamber’ Chris Carrigan and Bill examine. Friday, September 7th, 2018. Do we have adequate reserves to pay future pensions for Vermont teachers and State employees? And if not, what should we do to correct the situation? David Coates and Bill explore. Monday, August 27th, 2018. Should there be limits on the right to free speech, and if so, who should decide what those limits should be? Rob Roper and Bill explore. Later Rob and Bill consider how small school districts can protect against forced merger, by adopting school choice. Tuesday, August 28th, 2018. What is sustainable innovation in business, and what role does it play as future leaders prepare for the challenges and opportunities in business in the years ahead? UVM Grossman Business School Dean, Sanjay Sharma, joins Bill to explain. Wednesday, August 29th, 2018. How do we best achieve affordable, high quality health care in Vermont? Physician Louis Meyers and Bill take a closer look. Thursday, August 30th, 2018. What is the creative economy, and what role does it play sustaining jobs and community in Vermont? Burlington City Arts Director Doreen Kraft, joins Lake Champlain Chamber’s Tom Torti, and Bill to examine. Friday, August 31st, 2018. What do employment statistics tell us about the health of the Vermont economy? Art Woolf and Bill investigate. Later, the Tax Foundation’s Nicole Kaeding and Bill review how the changes in Federal Tax Law are affecting economic growth, capital investment, productivity, and employee income. Monday, August 20th, 2018. Should there be limits on the right to free speech, and if so, how should we decide what those limits should be? Rob Roper and Bill explore. Tuesday, August 21th, 2018. What are culture wars, what causes them, and is there hope for resolving them amicably? Author Bill Schubart and Bill take a closer look. Wednesday, August 22nd, 2018. How does the rapid pace of innovation in energy storage, generation, use affect our leading electric utility and the people of Vermont, at home and at work? Green Mountain Power CEO Mary Powell joins Bill to explain. Thursday, August 23rd, 2018. With low milk prices, dry cropland, and new regulatory burdens, Vermont’s dairy farmers are facing their greatest challenges in many years. How do we together overcome these obstacles, and find a pathway to prosperity? The Farm Bureau’s Jackie Folsom and Bill examine. Friday, August 24th, 2018. What is the Community Leadership Summit, and what should we know about important changes underway in communities throughout Vermont? Council on Rural Development’s Paul Costello reviews with Bill. Monday, August 13th, 2018. What is Real Vermont News, and how will help us all to be better informed about the important issues facing Vermont and her people. Founder Bob Frenier joins Rob Roper to explain. Tuesday, August 14th, 2018. With an update on energy news, Guy Page joins Bill to consider how we find the right balance of affordability, reliability, and renewability in the energy we use at home, at work, and in between the two? Thursday, August 16th, 2018. How do we best help our businesses to use energy efficiently? Vermont Energy Investment Corp’s Paul Lambert joins Lake Champlain’s Tom Torti and Bill explore. Friday, August 17th, 2018. How will the emerging trade war with Canada affect us here in Vermont? St. Michael’s College’s Robert Letovsky and Bill take a closer look. Monday, August 6th, 2018. What is paternalism, and why does Vermont rank 49th among the 50 states in the index of freedom from paternalism? What must we do to improve our ranking? David Flemming and Bill investigate. Tuesday, August 7th, 2018. What is it about our primary system in America that disfavors moderate candidates, in both parties, and contributes to division in Washington and State Capitols? And what is a simple and effective corrective action, which each of us can help accomplish. Tom Evslin and Bill take a closer look. Wednesday, August 8th, 2018. What choices we make will most affect the our income in retirement? Dan Cunningham and Bill explore. Thursday, August 9th, 2018. Should Act 250 be changed to further restrict property rights for rural landowners? John McClaughry and Bill consider the unintended consequences. Later, Mercatus Center’s Chuck Blahous joins Bill to explain how Single Payer Medicare for All would increase the federal budget by $3 trillion per year, and require a doubling of federal income taxes. Friday, August 10th, 2018. What is financial literacy, and why is it important to the future of our children, our economy and opportunity for all. Champlain College’s John Pelletier and Bill examine. Monday, July 30th, 2018. What are the consequences, intended and unintended, of a carbon tax on the families and businesses of Vermont. Patrick Gleason, Rob Roper, and Bill consider. Tuesday, July 31st, 2018. What should we know about the Nurses Strike at the UVM Medical Center, what should be done to resolve it, and how will it affect health care costs for the people of Vermont. UVM Medical Center President Eileen Whalen and Bill take a closer look. Later Art Woolf and Bill investigate why wages in Vermont are rising at about the rate of inflation, despite low unemployment, and what might happen to prices if wages begin to rise more rapidly. Wednesday, August 1st, 2018. What are the greatest threats to keeping our working forests working? And what are the greatest opportunities? Bruce Shields and Bill explore. Thursday, August 2nd, 2018. How can we make our manufacturing plants and our offices more efficient and productive? Vermont Manufacturing Extension Center’s Karl Swanke, joins Tom Torti and Bill Sayre to examine. Friday, August 3rd, 2018 What should we know about Vermont grown meat, and how it gets from our farms to our kitchens, in a way that meets high quality standards, nourishes local food markets, and is respectful of the diverse cultures and religions of new Vermonters? Randy Quenneville, chief of the Ag Agencies meat division, joins Bill to explain. Monday, July 23rd, 2018. Why do local governments spend money more carefully than their state government, and state governments more carefully than the federal government. Rob Roper and Bill consider. Tuesday, July 24th, 2018. What can we learn from two of Vermont’s leading entrepreneurs about what it takes to grow a business in Vermont, and thereby, to grow the Vermont economy by encouraging more businesses to make Vermont the place where they want to invest, grow, and hire. Creating our best chance at prosperity and opportunity for all. Tommy Harmon and Bruce Lisman join Bill to explain. Wednesday, July 25th, 2018. Do escalating tariffs threaten our economic recovery, with higher prices for what we buy and lower prices for what we sell? Jack McMullen and Bill explore. Thursday, July 26th, 2018. Are we making progress in the mission to understand and alleviate the opiate crisis in Vermont? Jolinda LaClair and Sara Byers, join Tom Torti and Bill to examine. Friday, July 27th, 2018 What are the most important public policy issues affecting the well being of the Vermont people, as individuals and as a community? Former Governor Jim Douglas and Bill review. Monday, July 16th, 2018. What is American exceptionalism, and has it been a significant factor in the growth and prosperity of our economy, and opportunity for our people? Rob Roper and Bill consider. Tuesday, July 17th, 2018 What are the key factors that affect health care affordability, quality, and access? And what is the role of government in slowing the growth in cost, while sustaining or improving quality and access? Secretary of Health and Human Services Al Gobeille, and Bill explore. Wednesday, July 18th, 2018. What are the fastest growing categories of Vermont State spending, what are reasons, and what are the consequences for taxpayers? Malcolm Stewart and Bill take a closer look. Thursday, July 19th, 2018. How do Vermont’s signature food products help create the Vermont Brand, and foster a favorable opinion, throughout the world, of our State, our people, the products we produce, and the services we provide. Chris Barbieri examines. Friday, July 20th, 2018. How can it be that we have young people in Vermont who believe they must move to another State to find a good job, and at the same time, Vermont businesses who believe they must create good jobs in other states, because they cannot find qualified employees here in Vermont. Kathy Labelle Lavoie and Bill explain. Later, Meg Hansen and Bill review new rules, written in Washington DC, and in Montpelier, governing association insurance plans. Monday, July 9th, 2018. Does a prohibition of single use plastic bags defeat its own purpose? Also what caused HUB Magazine to rank Vermont the 46th best state in which to start a new business? And what can we do to improve our ranking? Rob Roper and Bill examine. Later, Bill remembers the life and legacy of Charles Krauthammer. Tuesday, July 10th, 2018. What are the connections between healthy wildlife populations, healthy forests, and the people who earn their living from working forests? Vermont Fish and Wildlife Commissioner Louis Porter and Director of Wildlife Mark Scott join Bill to explain. Wednesday, July 11th, 2018. What is a trade war? And if we are in a trade war, with escalating tariffs here and abroad, what will be the affect on our well being, at home and at work? Dan Cunningham and Bill take a closer look. Thursday, July 12th, 2018. What are the key energy issues facing Vermont, as we strive to find the right balance among the sometimes competing energy goals of affordability, reliability, and renewability. Guy Page and Bill review. Friday, July 13th, 2018. Why do nations with the greatest economic and political freedom, tend to have the greatest prosperity and highest standard of living for their people? Matthew Strong and Bill investigate. Monday, July 2nd, 2018. How will the recent decisions by the United States Supreme Court, and the retirement of Justice Anthony Kennedy, affect the people of Vermont, and America? Rob Roper and Bill examine. Tuesday, July 3rd, 2018, 2018. What factors lead our Founders to write the Declaration of Independence? Historian Bruce Shields and Bill explain. Wednesday, July 4th, 2018. Independence Day. No Radio Show today. Instead, a day to celebrate American Independence at Parades or Bar-b-ques, and to remember and honor the reasons why we celebrate. Namely, the day that America’s noble experiment in self-government began. Thursday, July 5th, 2018. What were the important decisions in the Legislation session just completed. Representative Heidi Scheurmann joins the Lake Champlain Chamber’s Cathy Davis and Bill to review. Friday, July 6th, 2018. What role did Ethan Allen and the people of Vermont, play in the Declaration of Independence, and the Revolution that followed. John McClaughry and Bill explore. Later, Art Woolf and Bill take a closer look at how tariffs affect the people of Vermont, and America, at home and at work? Monday, June 25th, 2018. What are the unintended consequences of allowing Canadian purchases of drugs to be resold in the United States? David Flemming and Bill inquire. Later Jason Gibbs and Bill review the major issues to be resolved in this Legislative Session. Tuesday, June 26th, 2018. What should we know about how government policy can, and cannot, affect employee wages, salaries, and benefits? Sena Meilleur and Bill explain. Wednesday, June 27th, 2018. How concerned should we be about our federal deficits and federal debt? Malcolm Stewart and Bill explore. Thursday, June 28th, 2018. How do we best sustain Vermont agriculture and the important role of farmers in our rural economy, environment, and community. Secretary of Agriculture Anson Tebbetts and Bill examine. Friday, June 29th, 2018. What is the role of recycling in the Vermont economy. Agency of Natural Resources Josh Kelly and Chris Barbieri take a closer look. Later, Central Vermont Chamber’s Bill Moore and Chris consider the effect of this Legislative Session on the Vermont economy. Monday, June 18th, 2018. Do you believe the budget impasse in Montpelier is because our taxes are too low, or because our spending is too high? Rob Roper and Bill inquire. Later Rob and Bill take a closer look at the proposed $10,000 subsidy for new remote workers, and the implications for Vermont, from a Supreme Court decision on Ohio voter registration. Tuesday, June 19th, 2018. What is the best way to help people move from welfare to work? John McClaughry and Bill explain. Later, Meg Hansen and Bill consider the implications of Vermont’s newly created mandate to purchase health insurance. Wednesday, June 20th, 2018. What are the key challenges and opportunities Vermont’s working forests, and the people who earn their living in the Vermont Forest Product industry? Christine Dorsey McGowan and Bill review. Thursday, June 21st, 2018. What is the important role of travel, tourism, and related business in the Burlington economy? Burlington Business Association’s Kelly Devine joins Tom Torti and Bill to examine. Friday, June 22nd, 2018. What should we know about the economics and the law of Vermont housing markets? Economist Art Woolf, attorney Fred Peet, and Bill explore. Monday, June 11th, 2018. Do you believe the budget impasse in Montpelier is because our taxes are too low, or because our spending is too high? Rob Roper and Bill inquire. Later, Rob and Bill take a closer at the proposed $10,000 subsidy for new remote workers, and also the effect of new tariffs on Vermont employers. Tuesday, June 12th, 2018. What does one of Vermont’s leading entrepreneurs believe is the best way to grow our economy, making the cost of living more affordable for our people, and the cost of doing business more affordable for our job creators? Janitech’s Dawn Terrill explains with Bill. Wednesday, June 13th, 2018. What factors should you consider when saving and investing for your future? One Day in July’s Dan Cunningham and Bill examine. Thursday, June 14th, 2018. What key issues affect the cost, reliability, and carbon footprint of energy for Vermont homes and businesses? Guy Page and Bill review. Friday, June 15th, 2018. What is the best way to sustain our working forests and farms, and the loggers and farmers who work them? Sam Lincoln and Bill explore. Monday, June 4th, 2018. What do Tariffs, Taxes, and White Rhinoceroses have in common? David Flemming and Bill explain. Tuesday, June 5th, 2018. What are the public policy priorities of Campaign for Vermont? Pat McDonald, Eric LaMontagne, and Bill discuss. Wednesday, June 6th, 2018. Who has the Small Business Administration designated as Vermont’s Outstanding Businesses of 2018? Vermont Business Magazine’s John Boutin, SBA’s Darcy Carter, and Bill reveal and review. Thursday, June 7th, 2018. Can large industrial and commercial businesses concerned about Vermont energy efficiency charges get reductions in those charges if they invest in energy saving projects? Efficiency Vermont’s Abby White, Lake Champlain Chamber’s Tom Torti, and Bill explore. Friday, June 8th, 2018. Jason Gibbs and Bill take a closer look at the Governor’s Plan to hold the line on taxes and fees, and to slow the growth in education costs in the years ahead. Later, the Tax Foundation’s Scott Drenkard and Bill compare Vermont’s tax burden with that in other states. Monday, May 28th, 2018. Memorial Day. No Show. A day to remember all those brave Americans who gave their last full measure of devotion to protect our nation, our people, and the freedoms which we are privileged to enjoy. Tuesday, May 29th, 2018. Entrepreneur Paul Ralston joins Bill to explain how we can create policies that achieve legislative goals, more effectively and at lower cost to the taxpayers. Wednesday, May 30th, 2018. What can we learn by taking a closer look at the ways in which the State of Vermont raises tax revenue? Art Woolf and Bill consider. Later, Wendy Wilton, Vermont State Director of the USDA Farm Service Agency, discusses with Bill the role of the federal government in helping our Vermont farmers through difficult times. Thursday, May 31st, 2018. How do we best conserve, sustain, and harvest our natural resources, while at the same time, growing our economy and making the cost of living more affordable for our people, and the cost of doing business more affordable for our job creators. Natural Resource Agency Secretary Julie Moore explores with Bruce Lisman and Bill. Friday, June 1st, 2018. How does a successful organization use social media to advance its mission? Sara Munro and Alex Tursi join Bill to investigate. Monday, May 21st, 2018. Entrepreneur Paul Ralston joins Bill to discuss the power of the prize, and apply the idea to an innovative way to improve water quality, while at the same time producing renewable energy, and providing much needed income to our small to mid-sized dairy farmers. Tuesday, May 22nd, 2018. How does UVM Extension help our farmers succeed in difficult times. Extension’s Jenn Colby and Bill explain. Wednesday, May 23rd, 2018. Does the political culture at American colleges tend to stifle free speech there, particularly for students and faculty with conservative beliefs? Professor Robert Letovsky​, and students Ryan Wurmsdobler and Ryan Lawrence take a closer look. Thursday, May 24th, 2018. What does it take to start or grow a successful business in Vermont? Live from the Vermont Business Expo, Bill interviews exhibitors and attendees. Friday, May 25th, 2018. What are the key factors affecting the cost, quality, and availability of health care in Vermont? Blue Cross and Blue Shield President Don George examines with Bill. Monday, Monday, May 14th, 2018. As Legislators prepare for a veto session, will they work with the Governor to balance the budget without raising taxes? Rob Roper and Bill explore. Tuesday, May 15th, 2018. Sugarbush President Win Smith joins Bill for an update on the ski season, and perspective on the Legislative Session. Wednesday, May 16th, 2018. What legislation may prove harmful to our rapidly growing high tech industry. Vermont Technology Alliance’s Jeff Couture and Matt Dodds join Bill to take a closer look. Thursday, May 17th, 2018. Why has health care reform been so quiet this year? What controversial proposals are simmering beneath the surface? Megan Hansen and Bill explain. Friday, May 18th, 2018. Vermont Chamber of Commerce’s Betsy Bishop joins Bill to preview the Vermont Business Expo, and to review the Legislative Session. Monday, May 7th, 2018. As a showdown looms between the Governor and the Legislature, the biggest question before them is this: are taxes too low, or is spending too high? Rob Roper and Bill examine. Tuesday, May 8th, 2018. What factors affect the cost, reliability, and environmental impact of the energy we use in Vermont? Guy Page and Matthew Strong explore. Wednesday, May 9th, 2018. Why is it so difficult for any person or company to beat the stock market? Dan Cunningham and Bill investigate. Thursday, May 10th, 2018. Who are Vermont’s young entrepreneurs, and what new products and services are they creating to propel the Vermont economy into a prosperous future. Lake Champlain Chamber’s John Antonucci and Bill take a closer look. Friday, May 11th, 2018. What challenges and opportunities lie ahead for our loggers as they strive keep our forests productive and healthy? In particular, what role do women play in making this happen? Live from the Loggers’ Expo in Essex Junction, Colleen Goodridge, Kathleen Wanner, Wendy Farrand, Eileen Townsend, Errol Peters and Rocky Bunnell join Bill to explain. Monday, April 30th, 2018. As the Legislature enters the last few weeks of its Session, what are the major issues yet to be resolved? Rob Roper and Bill examine. Tuesday, May 1st, 2018. What are the chief challenges facing Vermont farmers, on the land, and in Montpelier. What is the best way forward? Vermont Farm Bureau’s Jackie Folsom and Bill review. Wednesday, May 2nd, 2018. What should we know about Governor Scott’s proposal for slowing the growth in education spending and property taxes? Jason Gibbs explains, in conversation with former Governor Jim Douglas and Bill. Thursday, May 3rd, 2018. How will new legislation affect Vermont job creators, job holders, and job seekers? Lake Champlain Chamber’s Cathy Davis and Bill take a closer look. Later Trey Martin joins Cathy and Bill to consider the important role of outdoor recreation in the Vermont economy. .
Friday, May 4th, 2018. How should, and should not, tax and regulatory policy be crafted to encourage entrepreneurs and other businesses to invest, grow, and hire in Vermont? Superior Technical Ceramic’s John Goodrich and Bill take a closer look. Monday, April 23rd, 2018. As the Legislation enters its last few weeks, what are the major issues yet to be resolved? Rob Roper and Bill examine. Also, Bill Driscoll calls about manufacturing issues and Eileen Townsend about the upcoming Loggers’ Expo. Tuesday, April 24th, 2018. Has the Endangered Species Act succeeded, or has it worked against its own purposes? What is a better way? Heritage Foundation’s Rob Gordon and Bill take a closer look. Wednesday, April 25th, 2018. What factors should we consider to improve our understanding of the economy and financial markets? Gabe Lajuenesse and Bill review. Thursday, April 26th, 2018. What policies will help the economy grow, while keeping the cost of living affordable for our families, and the cost of doing business affordable for our job creators? Bill Moore and Bill explain. Friday, April 27th, 2018. Is an opiate tax a good idea for Vermont? Americans for Tax Reform’s Patrick Gleason and Bill examine the unintended consequences of raising tax rates. And they discuss better ways to address the opiate crisis. Monday, April 16th, 2018. What has caused the great nations of history to fail, and what must our nation do to avoid the same fate? David Flemming and Bill explore. Tuesday, April 17th, 2018. How would a trade war with China affect the families and businesses of Vermont? St. Michael’s College Prof. Robert Letovsky and Bill examine. Later John McClaughry and Bill address the question of whether school consolidation actually slows the growth in education spending in Vermont. Wednesday, April 18th, 2018. Did you know our population, in most Vermont counties, is declining? What will this mean for our economy, our demands on the public treasury, and our capacity to pay taxes? Art Woolf and Bill review. Later Veronique de Rugy and Bill take a closer look at the issues at stake in the Supreme Court case to decide whether a State can for businesses in another state to collect taxes on internet sales. Thursday, April 19th, 2018. What are the economic challenges and opportunities for Burlington and for Vermont? Kurt Wright explains, with Tom Torti and Bill. Friday, April 20th, 2018. Remembering the first Earth Day, and understanding how best to sustain a healthy environment. 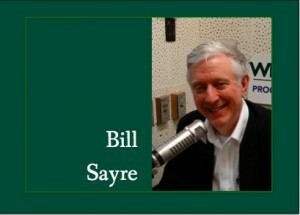 Bill interviews free market environmentalist scholar, R.J. Smith. Monday, April 9th, 2018. Can tariffs hurt the very people they are designed to help? Rob Roper and Bill consider the unintended consequences restricting free trade, along with other controversies in Washington and Montpelier. Tuesday, April 10th, 2018, Celebrating the 275th birthday of Thomas Jefferson, John McClaughry and Bill explain why his ideas are still important to us today..
Wednesday, April 11th, 2018. Why are high tech stocks such a big part of the stock index, and why are they so volatile lately? One Day in July’s Dan Cunningham and Bill examine. Thursday, April 12th, 2018. Why are the economics of producing milk so difficult for our farmers, and how will that difficulty affect us all? Bruce Shields and Matthew Strong take a closer look. Friday, April 13th, 2018. How can we sustain our working forests, if our loggers don’t have insurance? Will changes in insurance rates, coupled with stricter safety standards, improve the situation? Sam Lincoln and Bill explore. Monday, April 2nd, 2018. Controversial proposals before the Vermont Legislature: new taxes, school safety, and voter fraud. Rob Roper and Bill review. Wednesday, April 4th, 2018. Live from the Central Vermont Jobs Fair, Bill interviews four with special perspective in how best to help our young people start their careers. Emily MacFadyen of ReSource, Chris Manning of National Life, Josh Fitzhugh, and Labor Commissioner Lindsay Kurrle. Thursday, April 5th, 2018. What can we learn about Vermont products from the entrepreneurs exhibiting at the Made in Vermont Marketplace? Vermont Business Magazine’s John Boutin and Bill take a closer look. Ryan Christiansen of Caledonia Spirits, Kate Whelley McCabe of Vermont Evaporator, and Andrew Mill of Andrew’s Woodworking. Friday, April 6th, 2018. The Emerald Ash Borer, recently discovered in Vermont, is a forest pest that weakens and eventually kills while ash trees. Should we be concerned, and if so, what should we be doing about it? Vermont Ag. Agency Entomologist Judy Rosovsky and Bill explore. Monday, March 26th, 2018. What controversial proposals are before the Vermont Legislature: new taxes, gun control, and wage restrictions. Rob Roper and Bill review. Tuesday, March 27th, 2018. Where are the best places to work in Vermont. Vermont Business Magazine’s John Boutin and Bill interview three award winners. Bob Foley of New Chapter, Kevin McCollister of Catamount Solar, and Ernie Pomerleau of Pomerleau Real Estate. Wednesday, March 28th, 2018. What are the most important energy issues affecting the families and businesses of Vermont? Guy Page and Matthew Strong explore. Thursday, March 29th, 2018. How do we best grow the economy and make Vermont more affordable, while protecting the most vulnerable. Lake Champlain Chamber’s Tom Torti and Bill explain. Later, Vermont Senate Pro Tempore Tim Ashe joins Tom and Bill to discuss competing ideas about how best to raise the income of low income workers. Friday, March 30th, 2018. What is the Snelling Center, and how do they build skills for present and future leaders in Vermont government, business, education, and our communities. Mark Snelling, Suzanne Trahey, and Bill take a closer look. Monday, March 19th, 2018. Are property taxes too high because income taxes are too low? Rob Roper and Bill examine the Legislature’s plan to reduce property taxes by raising income taxes. Tuesday, March 20th, 2018. What are the chief challenges facing Vermont Agriculture, and how do we best overcome them? Vermont Ag. Secretary Anson Tebbitts, and Bill explore. Wednesday, March 21st, 2018. Are markets shifting toward locally grown and processed wood products, just as they have for locally grown and processed food products? Tree House Hardwoods’ Lucas Jensen, and Bill take a closer look. Thursday, March 22nd, 2018. How do we best grow the economy, while making the cost of living more affordable for our people and the cost of doing business more affordable for our job creators? Tom Torti and Bill explain. Friday, March 23rd, 2018. What can we learn from the web site known as The Informed Vermonter? Malcolm Stewart, its author, and Bill, review. Monday, March 12th, 2018. Have our opinions changed about School Safety and the 2nd Amendment, after the tragic shootings at a school in Florida, and a near tragedy at a school in Vermont? Bill Moore, of the Vermont Traditions Coalition, and Rob Roper examine..
Tuesday, March 13th, 2018. What are the most important energy issues facing Vermont, and what role should government play in addressing them? Guy Page and Bill review. Wednesday, March 14th, 2018. What is the Agency Problem, what does it mean for investors, and how can it best be addressed? One Day in July’s Dan Cunningham and Bill explain. Thursday, March 15th, 2018. What is the Vermont Farm Bureau and what issues are most important to our farmers as they sustain the rural economy, environment, and culture? Bruce Shields and Matthew Strong explore. Friday, March 16th, 2018. How can students with conservative beliefs exercise their rights of free expression, contribute to the diversity of political opinion, and compete in the marketplace of ideas. Rob Roper and David Flemming take a closer look. Monday, March 5th, 2018. Taxes and Tariffs and Take Home Pay.. How do we best raise the income of the Vermont and American people? Rob Roper, Fred Baser, and Bill explore. Tuesday, March 6th, 2018 What is the Farm Service Agency, and what important role does the Agency play in sustaining Vermont Agriculture? State Director Wendy Wilton and Bill examine. Wednesday, March 7th, 2018. How can we harness the energy and creativity of entrepreneurs, markets, and innovation, to improve water quality in Vermont? Paul Ralston and Bill investigate. Thursday, March 8th, 2018. What new taxes might the Legislature impose upon the individuals, families, and businesses of Vermont. Vermont Tax Commissioner Kaj Samsom and Bill take a closer look. Friday, March 9th, 2018. Why are sustainable working forests and farms, and traditional ways of earning a living and recreating, important to keeping alive Vermont’s rural culture, environment, and economy. Bruce Shields and Ed Larson explain. Monday, February 26th, 2018. Has our view changed about school Safety and the 2nd Amendment, after the tragic shootings at a school in Florida, and a near tragedy at a school in Vermont? Rob Roper and Bill examine. Tuesday, February 27th, 2018. Why is important to understand our Millennials, if we are grow the workforce and the economy, improving opportunity and prosperity for all. Jim Black and Bill explore. Wednesday, February 28th, 2018. What is the Vermont Program for Quality in Health Care, and how do it help control costs, while sustaining quality in Vermont health care services? Executive Director Catherine Fulton, Director of Transformation, Lee Bryan, and Bill take a closer look. Thursday, March 1st, 2018. Why is workforce training important to the future of Vermont’s construction industry, and why is the construction industry important to the future of the Vermont economy? Tom Clavelle and Gina Catanzarita of Engelberth Construction, Mary Ann Sheahan of the Vermont Talent Pipeline and the Vermont Business Roundtable, and Bill explain. Friday, March 2nd, 2018. Why is the F 35 good for our families, our economy, and our national security? Frank Cioffi and Bill review. Later, what is the Earned Income Tax Credit, and why is it a better way to help low income families than government regulation of wages? Economist Art Woolf and Bill consider. Monday, February 19th, 2018 What are the most important energy policy issues facing Vermont, and how do they affect the cost of living for our families, and the cost of doing business for our job creating enterprises? Guy Page and Bill review. Tuesday, February 20th, 2018. What important opportunities and challenges lie ahead for Vermont’s largest electrical utility? Green Mountain Power CEO Mary Powell and Bill examine. Wednesday, February 21st, 2018. What’s outlook for the American economy, and how will that outlook, and other factors, affect the American stock market? Gabe Lajeunesse and Bill investigate. Thursday, February 22nd, 2018. How will advances in technology and science affect the competitiveness of Vermont businesses, and the lives of the Vermont people? Dan Feliciano and Bill explore. Friday, February 23rd, 2018. Why is skiing so important to the Vermont economy, environment, and culture? How is the industry doing this winter? And how policy in Montpelier affects the industry, and its customers? Sugarbush CEO Win Smith takes a closer look, with Bill. Monday, February 12th, 2018 What do the Vermont Senate and the Federal Veterans Administration have in Common? And how does what they have in common affect the cost of health care, and patient choice? Rob Roper and Bill explore. Tuesday, February 13th, 2018. Why is it important for government to live within its means, if the economy is to grow, and people are to keep more of the money they earn? Former Governor Jim Douglas and Bill explain. Wednesday, February 14th, 2018. Should we be concerned about the recent declines in the stock market? Why or why not? One Day in July’s Dan Cunningham and Bill take a closer look. Thursday, February 15th, 2018. What can we learn from the Buildings by Design Conference about how to use energy more efficiently as we construct new places to work and live? Efficiency Vermont’s Karen Glitman, Tom Torti, and Bill review. Friday, February 16th, 2018. How will a Carbon Tax affect the families, businesses, and economy of Vermont? Jonathan Lesser and Bill examine. Monday, February 5th, 2018. Will the Legislature allow Vermont taxpayers to keep the $30 million in Vermont tax savings, resulting from the tax cut in Washington DC? Rob Roper and Bill investigate. Tuesday, February 6th, 2018. What is captive insurance, why is Vermont an international leader in the captive insurance industry, and what can we apply from the success of Vermont’s captive insurance industry to other parts of Vermont? Peter McDougall, of Paul Frank and Collins, explains with Bill. Wednesday, February 7th, 2018. What is pro-active management, and how can we use it to improve the efficiency and effectiveness of Vermont government, and the competitiveness of Vermont business. NPI’s John Burton and Bill take a closer look. Thursday, February 8th, 2018. How can learning the history of how Lake Champlain and her River Tributaries have contributed to our economy in the past, help build and sustain Lake based tourism for our Vermont economy today and in the future? Maritime Museum’s Art Cohn, Lake Champlain Chamber’s Tom Torti, and Bill explore. Friday, February 9th, 2018. How do we best create opportunity and prosperity for Vermont and her people? The Vermont Chamber’s Betsy Bishop and Bill review. Monday, January 29th, 2018. Why all the controversy over using a computer in Montpelier to do your car inspection? Valerie Mullin, Rob Roper and Bill Sayre investigate? Wednesday, January 31st, 2018. What role does Alpha Gamma Rho Fraternity play in creating future leaders agricultural leaders? Live from the Vermont Farm Show, Laurence C Jost, Terry Gulick, and Bill examine. Later John Buck and Bill review the work of the Vermont Woodlands Association in promoting better understanding of how sound forest management creates better habitat for song birds. Thursday, February 1st, 2018. Live from the Vermont Farm Show, Chris Hill of Lely Robotic Milking Systems, with Bill, describe how new technologies improve the lives of our Vermont Dairy Farmers. Later, Agri-Mark Co-op’s Bob Wellington and Bill take a closer look at the effect of low milk prices on our farmers, and how dairy cooperatives help offset the decline, through the manufacture and sale of value added products, like Cabot cheese, yogurt, and butter. As Bob and Bill continue in their discussion of challenges and opportunities facing Vermont agriculture, they are joined, from time to time, by UVM Extension leader Chuck Ross, Lt. Gov. David Zuckerman, and Congressman Peter Welch. Friday, February 2nd, 2018. Why is it important for State government to live within its means, with no increase in taxes and fees, if we are to grow the Vermont economy, and improve affordability, while protecting the vulnerable. Governor Phil Scott explains with Bill. Later, Art Woolf and Bill review the latest economic trends, and what they mean to the future of our our Vermont families and businesses. Monday, January 22nd, 2018. Will a government mandated minimum wage of $15 per hour help or hurt low income individuals and families? David Flemming and Bill take a closer look. Tuesday, January 23rd, 2018. What are the best ways to control education spending, and thereby, property tax burdens? Vermont Business Magazine’s Tim McQuiston and Bill explore. January 24th, 2018. What is the single most pressing problem facing Vermont, and what should be done to address it? Saint Michael’s College’s Professor Robert Letovsky wants to know what you think. Thursday, January 25th, 2018. What is financial literacy, why is it important, and how well are we doing compared with other states in the nation? Champlain College’s John Pelletier and Bill investigate. Friday, January 26th, 2018. Why did the Framers of the Constitution believe the right to bear arms is a fundamental, and uniquely American, individual freedom? And should the Vermont legislature impose restrictions on that freedom? Chris Bradley, Bill Moore, and Bill explain. Monday, January 15th, 2018. A review of some controversial issues upcoming in Montpelier: gun control, bicycle fee, poverty, Medicaid, property taxes and carbon taxes. Rob Roper and Bill Sayre take a closer look. Tuesday, January 16th , 2018. How could Vermont rank 49th in business climate competitiveness, why should we care, and what must we do to improve? Bruce Shields and Bill explore. Wednesday, January 17th, 2018. What are the most important energy issues facing Vermont, and how do we best address and resolve them? Guy Page and Bill examine. Thursday, January 18th, 2018. Are we in danger of losing our free trade agreement with Canada, and why should we want to make sure that doesn’t happen? Trade expert Birgit Mattisen, joins Tom Torti and Bill to explain. Monday, January 8th, 2018. With more people migrating from Vermont than migrating into Vermont, along with slow economic growth, and some of the highest taxes of any State in the nation, what are the priorities for our Vermont Legislature? Marijuana legalization, government set wages and prices, and higher education taxes. Rob Roper and Bill review. Tuesday, January 9th , 2018. What should we know about the central Vermont economy, and how can we best promote opportunity and prosperity there? Central Vermont Chamber’s Bill Moore and Bill take a closer look. Wednesday, January 10th, 2018. What is the Buffet Challenge, and what can we learn from it about the stock market, and index funds? Dan Cunningham and Bill examine. Thursday, January 11th, 2018. Will there be pension money for our Teachers and State Employees when they retire? David Coates and Bill investigate. Friday, January 12th, 2018. Why do we say Demographics are Destiny? Art Woolf and Bill explain. Later Robert Letovsky and Bill explore the important role that entrepreneurs play in our economy, particularly entrepreneurs who are military veterans? Monday, January 1, 2018. New Year’s Day. Today’s show is a replay of a conversation with former Governor Jim Douglas about how best to grow the economy, live within our means, and create opportunity and prosperity for the people of Vermont. Tuesday, January 2nd , 2018. What are the priorities for the Vermont Legislature in the year ahead, and how well do these priorities match with the Governor’s goal of holding the line on new taxes and spending? Guy Page and Bill review..
Wednesday, January 3rd, 2018. How will tax reform, newly adopted in Washington DC, affect our individuals, families, and businesses – in Vermont, and in America. The Tax Foundations Jared Walczak and Bill examine.